Dogs for Good has received a significant boost for the Dementia Dog Project that the charity runs in partnership with Alzheimer Scotland, thanks to a National Lottery grant from the Big Lottery Fund. 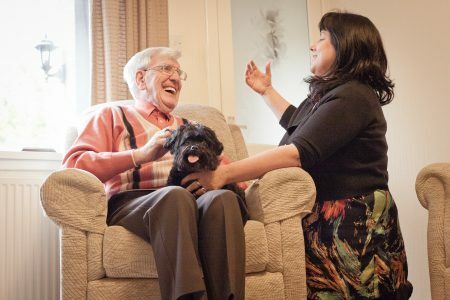 The grant, of £314,022, will allow the charity partners to take their learnings beyond an individual assistance dog approach, to support people with dementia in community settings. The funding will enable Dogs for Good and Alzheimer Scotland to pilot a series of ‘Dog Day’ community events and goal-oriented therapy intervention pilots in Scotland and trial areas in England, using trained dogs. The therapy, known as Animal Assisted Intervention (AAI) is a well-established practice in many parts of the world, but is less advanced in the UK. Specialist handlers and trained activity and therapy dogs work alongside support workers and health care professionals to help people facing daily challenges, in this case for people living with dementia. More than 500 people living with dementia will directly benefit from these initial trials, with evaluation measuring wellbeing and economic benefits for both the people with dementia and their carers. Community Dogs, supplied by Dogs for Good, will undergo their advance training at HMP Castle Huntly, an open prison near Dundee and the operational base for the Dementia Dog Project. Here, working with the Scottish Prison Service and Paws for Progress CIC, this innovative partnership enables men in custody to gain valuable employability skills and improve their overall well-being, while also helping to provide highly trained dogs to help people living with dementia. In the community, pools of volunteer handlers and their pet dogs will also be recruited and trained in trial areas, to help establish new training standards and test the viability of delivery mechanisms on a larger future scale. Find out more about the Dementia Dog Project.